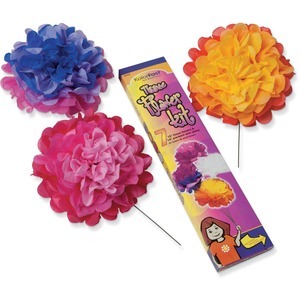 Create beautiful, brightly colored, 10" tissue flowers using this KolorFast Tissue Flower Kit. Simply accordion-fold tissue, attach stem and primp tissue to create a readymade bouquet, centerpiece or party decoration. This flower kit contains instructions, wire stems and enough pre-cut KolorFast Tissue with scalloped edges to create seven flowers. Tissue is nonbleeding.